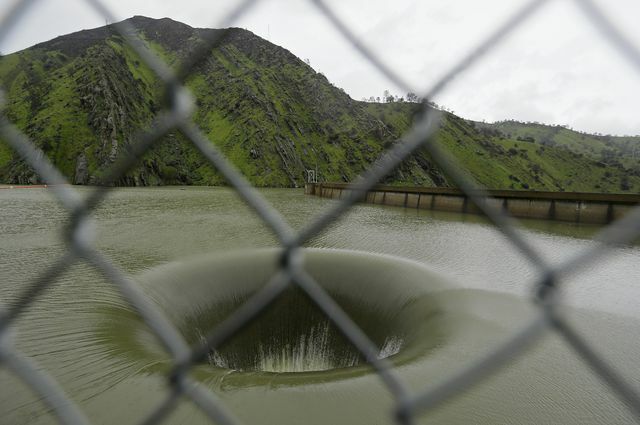 Because of the recent storms, water is flowing for the first time in more than a decade into the 72-foot diameter Glory Hole spillway at Monticello Dam in Lake Berryessa, California. 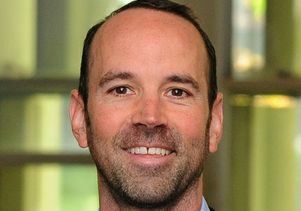 Alex Hall is a UCLA professor of atmospheric and oceanic sciences and a member of the UCLA Institute of the Environment and Sustainability. 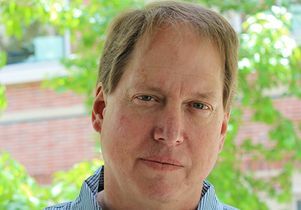 Mark Gold is UCLA’s associate vice chancellor for environment and sustainability. This op-ed appeared in the Sacramento Bee. The crisis at Oroville Dam should be a wake-up call to those making infrastructure decisions today that will affect Californians for many years to come. A centerpiece of the massive State Water Project, which provides water to 25 million Californians, has proved highly vulnerable to the kind of heavy winter rains we’ll see more often under climate change. Long a leader on action to curb climate change, California must now confront the inevitable impacts to which global greenhouse gas emissions have committed us. The scale of the Oroville Dam project highlights the challenge. Completed in 1968, the dam cost about $3 billion in today’s dollars. Such dams typically have long life spans, in effect committing several generations to decisions made with an outdated state of knowledge. 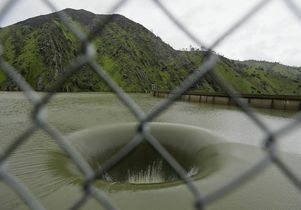 For example, it is now apparent that Oroville Dam’s spillways are subject to major erosion, risking nearly 200,000 lives and hundreds of millions of dollars of property. We point this out not to criticize past engineering choices, but rather to emphasize what is at stake with each infrastructure decision. One probable factor in engineering the spillways to a lower standard was an assumption that the kind of climatic event we are now experiencing would be very rare. Indeed, this is a highly unusual winter. In the northern Sierra Nevada, precipitation to date is 230 percent of normal, and the region is on track to see its wettest year in recorded history. Record precipitation has led to record snow accumulation in some locations. However, the extra snow is not proportionate to the overall precipitation increase. Currently, snowpack in the northern Sierra is just 157 percent of normal, not the more-than-doubling we would expect. In other words, what makes this winter so extreme is how much rain we’re getting, as opposed to snow. Instead of being stored in frozen form until spring snowmelt sends it gradually downstream, rain runs off immediately, filling reservoirs quickly. The reason for this shift is that it’s warmer than normal, so a greater share of precipitation is falling as rain. There’s reason to believe climate change is at play. For example, research from one of our labs found that between 2012 and 2015, human-caused warming resulted in a snowpack roughly one-fifth smaller than would otherwise have accumulated. Looking toward the future, climate modeling studies conducted at UCLA and elsewhere show significant declines in Sierra snowpack over this century. These declines are due not to changes in overall precipitation totals, but rather to a shift from a snow-dominated to a rain-dominated regime. This means we can expect to see more years like this one. The situation that Oroville Dam engineers once considered rare will become more common. California’s water infrastructure was built to handle flows based on the historic record, when greenhouse gas concentrations were well below their current levels of more than 400 parts per million and climbing. But our infrastructure needs to be designed for California’s climate future. We can no longer afford to make infrastructure decisions that do not explicitly account for climate change. Instead, the state must tackle adaptation issues head-on. This will require more research to better model and understand future impacts, a commitment to incorporating such research findings into planning, and on-the-ground projects that protect vulnerable communities and industries. California leads the world in climate science, greenhouse gas reduction strategies and climate mitigation investments, but we have largely neglected our responsibility to make the state more resilient to climate change. Currently, there is no mechanism to fund adaptation research and implementation projects that comes close to matching the scale of our challenges. Among the urgent needs is a water infrastructure vulnerability assessment that includes dams, aqueducts and coastal aquifers. This assessment must be used to develop a priority list for retrofits and construction, to be completed before future crises arise. In addition to water resources, we must also deal with other types of climate-related challenges, including increased risk of wildfire, public health impacts and sea level rise. State lawmakers should heed the lessons of Oroville Dam and act to ensure our resiliency to a changing climate. Mark Gold, associate vice chancellor for environment and sustainability at UCLA.